In 1993, the introduction of the Royal Oak Offshore brought about additional change, introducing a compelling new twist to the iconic Royal Oak. The Offshore pushed the boundaries of watchmaking even further, offering new materials, new sizes, and sportier functionality. The Royal Oak Offshore Chronograph, a dramatic timepiece with stopwatch functionality -- side pushers enabling you to stop, start, reset without interfering with the time. Selfwinding watch with chronograph function, hours, minutes, small seconds, date. 44 MM black ceramic case, glareproofed sapphire, titanium glareproofed sapphire crystal caseback, black ceramic bezel, screw-locked crown and pushpieces, titanium pushpiece guards and links. Anthracite dial with “Méga Tapisserie” pattern, anthracite counter at 12 o’clock, anthracite counters with grey outer zone at 6 and 9 o’clock, white gold applied hour-markers and Royal Oak hands with luminescent coating, grey inner bezel, black rubber strap. 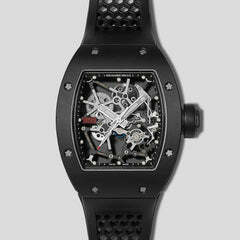 Water resistant to 100 meters with a 50-hour power reserve. 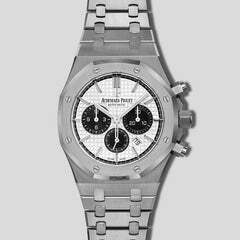 Material Good is an authorized Audemars Piguet dealer, our new watches come guaranteed with a full factory warranty.